This is the spanish equivalent of a pie. But these little beauties are more delicious than any pie I’ve ever eaten. They’re just the right size for pigging out on too. Great for parties served with a light tomato sauce to dip them in. This will make 24 little bitesize snacks. Sift the flour and 1 teaspoon or salt into a large bowl. Rub the butter in with your hands until the mixture resembles fine breadcrumbs. Combine the beaten egg with the wine and pour into the mixture. Mix with a flat knife to form the dough. Turn out onto a lightly floured surface and shape into a large ball. Don’t knead the pastry otherwise it’ll be tough as old boots. Cover in plastic wrap and refridgerate for 30 minutes. Meanwhile, to make the filling heat the oil in a frying pan over a medium heat. Gently fry the onions for 5 minutes until soft. Add the tomato puree and canned tomatoes and simmer for 10 minutes until thick. Add the tuna, roasted capsicum, parsley and salt & pepper. Remove from the heat and allow to cool. After the pastry has chilled cut in half, dust a work surface with flour and roll out on half of the pastry to a tickness of about 2mm. Using a pastry cutter or top of a drinking glass cut into 12 rounds. Place a heaped teaspoon of the filling in the centre of a pastry round and fold up the edges. With a little water wet the edges and then press together with your fingers. 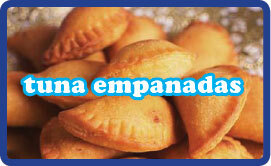 Dust each empanada in flour. Repeat with the remaining pastry and mixture. NOTE: If you are making in advance you can stop here. Arrange the empanadas on some grease proof paper, cover and freeze until you need them. If you’re cooking them right away, preheat the oven to 190ºC. Lightly oil a baking sheet and using the remaining eggs, beaten, brush each empanada before baking in the oven for 30 minutes until golden. You can also cook from frozen – just add 10-15 minutes to the cooking time – being careful not to burn them. Serve warm or cold either on their own or with a simple tomato paste to dip them in.